Willow is the common name for any of the deciduous trees and shrubs comprising the genus Salix of the flowering plant family Salicaceae, characterized by flowers borne in catkins, tiny seeds with long, silky hairs, and alternate leaves. The word willow also is used for the strong, lightweight wood of these plants, which has commercial use. While willow is the common name in general for plants of this genus, and most species have willow as part of their common name, some narrow-leaved shrub species are called osier, and some broader-leaved species are called sallow. (The latter name is derived from the Latin word salix, for "willow.") This article will use the word willow as the general name for members of this genus. There are about 400 species of willow. Willows are found primarily on moist soils in cold and temperate regions of the Northern Hemisphere. Some willows (particularly arctic and alpine species), are low-growing or creeping shrubs; for example the dwarf willow (Salix herbacea) rarely exceeds six centimeters in height, though spreading widely across the ground. Willows are very cross-fertile and numerous hybrids occur, both naturally and in cultivation. 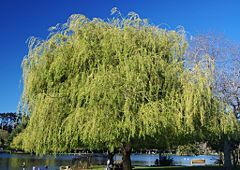 A well known example is the weeping willow (Salix × sepulcralis), very widely planted as an ornamental tree, which is a hybrid of a Chinese species and a European species—Peking willow and white willow. Willows provide important ecological functions for erosion control along watercourses, and habitat and food for animals. For people, in addition to aesthetic and shade uses, the wood provides an important source of timber and the plant has a long history of medicinal use as the source of salicylic acid, the precursor to aspirin. Willows all have slender branches; large, fibrous, often stoloniferous roots; abundant watery sap; bark that is heavily charged with salicylic acid; and soft, usually pliant, tough wood. The roots are remarkable for their toughness, size, and tenacity of life, and roots readily grow from aerial parts of the plant. The leaves are typically elongated but may also be round to oval, frequently with a serrated margin. All the buds are lateral; no absolutely terminal bud is ever formed. The buds are covered by a single scale, enclosing at its base two very small opposite buds, alternately arranged, with two, small, scale-like, fugacious, opposite leaves. The leaves are alternate, except the first pair, which fall when about an inch long. They are simple, feather-veined, and typically linear-lanceolate. Usually they are serrate, rounded at base, acute, or acuminate. The leaf petioles are short, the stipules often very conspicuous, looking like tiny round leaves and sometimes remaining for half the summer. On some species, however, they are small, inconspicuous, and fugacious (soon falling). In color, the leaves show a great variety of greens, ranging from yellowish to bluish. Willows are dioecious with male and female flowers appearing as catkins on different plants; the catkins are produced early in the spring, often before the leaves, or as the new leaves open. The staminate (male) flowers are without either calyx or corolla; they consist simply of stamens, varying in number from two to ten, accompanied by a nectariferous gland and inserted on the base of a scale, which is itself borne on the rachis of a drooping raceme called a catkin, or ament. This scale is oval and entire and very hairy. The anthers are rose colored in the bud but orange or purple after the flower opens, they are two-celled and the cells open longitudinally. The filaments are threadlike, usually pale yellow, and often hairy. The pistillate (female) flowers are also without calyx or corolla; and consist of a single ovary accompanied by a small flat nectar gland and inserted on the base of a scale, which is likewise borne on the rachis of a catkin. The ovary is one-celled, the style two-lobed, and the ovules numerous. The fruit is a small, one-celled, two-valved, cylindrical beaked capsule containing numerous tiny (0.1 mm) seeds. The seeds are furnished with long, silky, white hairs, which allow the fruit to be widely dispersed by the wind. Almost all willows take root very readily from cuttings or where broken branches lie on the ground. There are a few exceptions, including the goat willow and peachleaf willow. One famous example of such growth from cuttings involves the poet Alexander Pope, who begged a twig from a parcel tied with twigs sent from Spain to Lady Suffolk. This twig was planted and thrived, and legend has it that all of England's weeping willows are descended from this first one (Hone 1826). Willows are often planted on the borders of streams so that their interlacing roots may protect the bank against the action of the water. Frequently, the roots are much larger than the stem that grows from them. Willows are valuable for erosion control along watercourses. A number of willow species were widely planted in Australia for this purpose. They are now regarded as an invasive weed and many catchment management authorities are removing them to be replaced with native trees (Cremer 2003; AWWMWG 1998). Willows are used as food plants by the larvae of some Lepidoptera species, and the seeds are consumed by birds. Willow trees produce a modest amount of nectar that bees can make honey from, and are especially valued as a source of pollen for bees. The leaves and bark of the willow tree have been mentioned in ancient medicinal texts from Assyria, Sumer, and Egypt as a remedy for aches and fever (Breasted 2007; Nobel 2008) and the Ancient Greek physician Hippocrates wrote about its medicinal properties in the fifth century B.C.E.. Native Americans across the American continent relied on it as a staple of their medical treatments. This is because they contain salicylic acid, the precursor to aspirin. In 1763, the medicinal properties of willow were observed by the Reverend Edward Stone in England. He notified the Royal Society who published his findings. The active extract of the bark, called salicin, was isolated to its crystalline form in 1828 by Henri Leroux, a French pharmacist, and Raffaele Piria, an Italian chemist, who then succeeded in separating out the acid in its pure state. Salicin is acidic when in a saturated solution in water (pH = 2.4), and is called salicylic acid for that reason. In 1897, Felix Hoffmann created a synthetically altered version of salicin (in his case derived from the Spiraea plant), which caused less digestive upset than pure salicylic acid. The new drug, formally Acetylsalicylic acid, was named aspirin by Hoffmann's employer Bayer AG. This gave rise to the hugely important class of drugs known as non-steroidal anti-inflammatory drugs (NSAIDs). Willows are popular as ornamental trees and for shade. 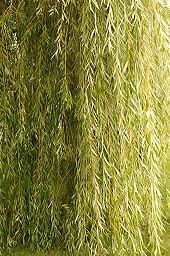 For example, the weeping willows, with their long, drooping branches are popular for such purposes. They may be used as hedges and for windbreaks. The catkins also are popular in arrangements for display. The strong, but soft and pliant wood is used for a number of purposes as timber, including making boxes, crates, wicker furniture, brooms, cricket bats (grown from certain strains of white willow), cradle boards, chairs and other furniture, dolls, flutes, poles, sweat lodges, toys, turnery, tool handles, veneer, wands, whistles, and boats. The wood also is used for fuel and charcoal. Other wood-derived products include paper, rope, and using the shoots for basket weaving, fish traps, and wattle fences, and willows are used for tannin. Willow bark contains auxins: plant growth hormones, especially those used for rooting new cuttings. The bark can even be used to make a simple extract that will promote cutting growth. 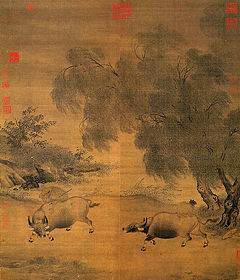 The willow is a famous subject in many East Asian nations' cultures, particularly painting (pen and ink) in China and Japan. As one of the "Four Species," the willow is used in a ceremony on the Jewish holiday of Sukkot. 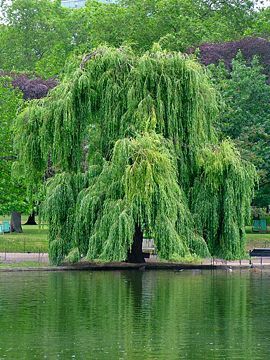 Also the willow is one of the nine sacred trees mentioned in wicca and witchcraft, with several magical uses. Salix discolor used in a decorative arrangement outside a hotel in Boston, Massachusetts. Albury/Wodonga Willow Management Working Group (AWWMWG). 1998. Willows along watercourses: Managing, removing and replacing Department of Primary Industries, State Government of Victoria. Retrieved October 20, 2008. Breasted, J. 2007. The Edwin Smith Papyrus Tour Egypt. Retrieved October 20, 2008. Cremer, K.W. 2003. Introduced willows can become invasive pests in Australia Biodiversity 4(4): 17-24. Retrieved October 20, 2008. Hone, W. 1826. August 9. Floral directory. The willow The Every-Day Book (Electronic Edition). Keeler, H.L. 1900. Our Native Trees and How to Identify Them. New York: Charles Scriber's Sons. Mabberley, D.J. 1997. The Plant Book. Cambridge: Cambridge University Press. ISBN 0521414210. Newsholme, C. 2003. Willows: The Genus Salix. Portland, OR: Timber Press. ISBN 0881925659. Nobel Prize. 2008. An aspirin a day keeps the doctor at bay: The world's first blockbuster drug is a hundred years old this week Nobelprizes.com. Retrieved October 20, 2008. Warren-Wren, S.C. 1992. The Complete Book of Willows. South Brunswick, A.S. Barnes. ISBN 049801262X.